This was an important day; my log entry doesn't come close. 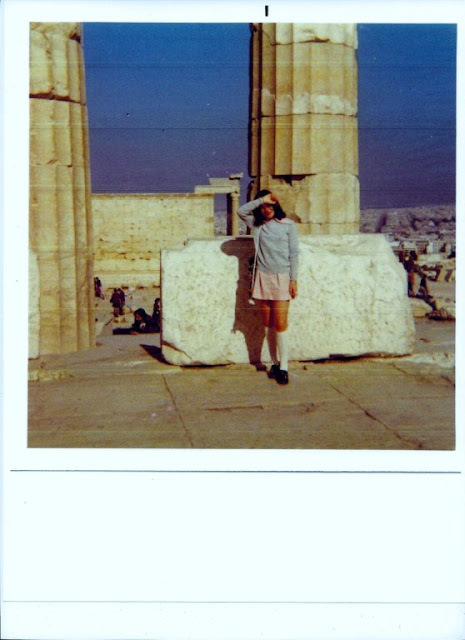 The Parthenon had a profound effect on me. My mum, an amateur historian, always said that some folk had "a sense of history" and by this she meant, could "feel" the past when standing at a ancient site. I attach a photo of me in the precise spot where I felt overcome with emotion: people had stood in this same spot for hundreds, no, thousands of years and I could sense their presence, hear their footsteps, feel their emotions. It was the first time I'd ever had that sensation. You'll also notice in the picture my school uniform. We'd been advised that our skirts should be an "appropriate" length. I lengthened my skirt 2" for the cruise. Imagine it beforehand...I must've been flashing me frilly bloomers to all and sundry. I recall being appalled by the lecherous men on the Metro. Interesting that I describe both Athens and Piraeus as clean...I've been there many times since and I think them among the dirtiest, dustiest places I've ever been. Alison's birthday. We were called to disembarkation stations at 910 and went on another guided coach tour. This time our coach was no. 3 and our guide spoke like Charles Boyer. He was very nice. The Acropolis was beyond compare. It is the loveliest thing I have ever seen before. We then went round Athens and Piraeus which were very large and clean. We went back to the ship for lunch but we were late. When we redisembarked we went to the museum in Athens. This seemed small at first but turned out quite large. We had taken the underground there and took it back but we still did some walking and I was surprised to find that the men thought we were wearing very short skirts. We did a little window shopping on the way back, because we had no money left to buy anything. In the evening, shore visits were permitted if escorted by a member of staff. I didn't go and instead went to a small dance held in the verandah. We went to bed at 10:00 because the others were late back.